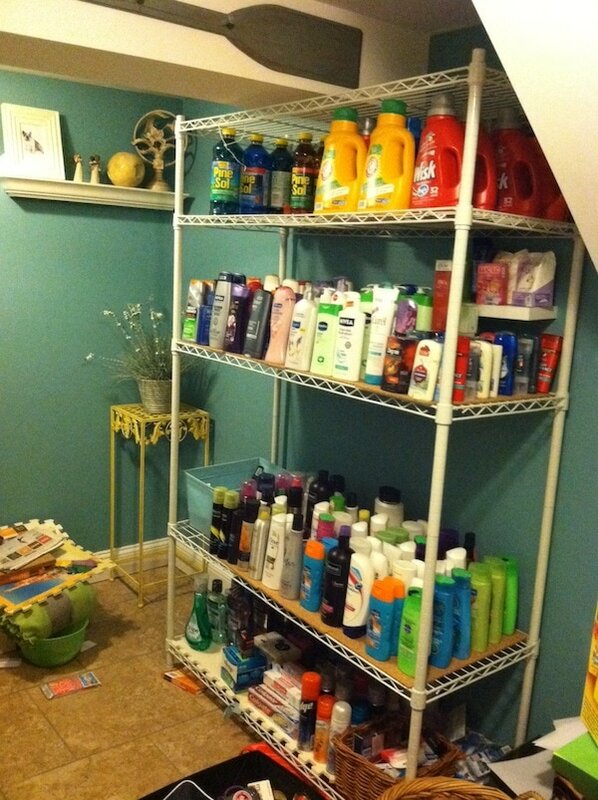 As you can guess, I am pretty obsessed with couponing. I’ve actually made it my life mission to get every single person I know to start using them on some level. I’m not saying they should become psychotic like me, but I want them to at least understand the process. That’s why I’ve written ‘What is Extreme Couponing?’ and ‘Extreme Couponing: A Realistic Approach‘. Some people might not want to read pages and pages of extreme couponing tips. So, instead – I thought to sum it all up into easy couponing steps that anyone can follow. So, here it is! With the Internet, it won’t be hard to figure out what sale each grocery store near you is promoting for that week. Every circular is posted online. I’m sure you get a nice bundle in the mail each week too showing you next week’s sales. 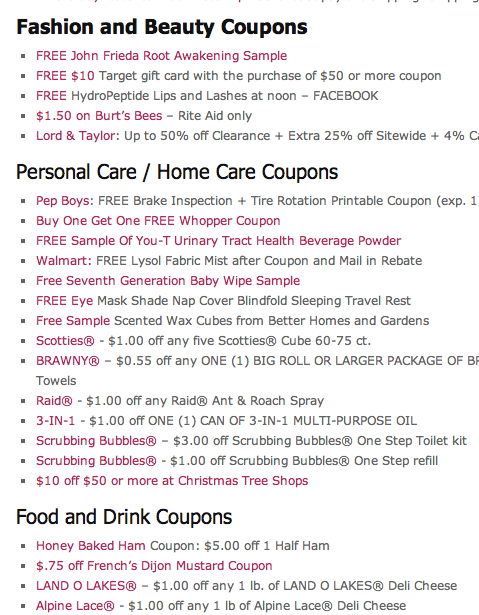 Personally, I like to visit a site called ‘Living Rich with Coupons’ -(http://livingrichwithcoupons.com). She somehow works through a few dozen circulars in their entirety and shows you how much everything will cost. If there is a coupon to print, she has it linked which makes couponing super easy and manageable. Here is a screen grab from her site. I shop at King Kullen because they double $1 coupons (up to 5 per order). Her prices reflect that. So, take a look. 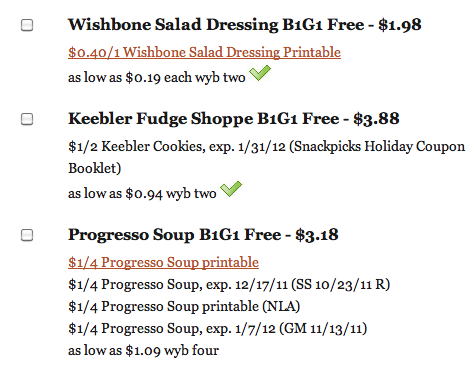 You can see that this week if I print out that Wishbone salad dressing coupon, my price will be $.19 per bottle (when I buy 2). NICE PRICE! Choose your store from her list and see how much you can save using her site. This is also a nice lead in to my next tip. 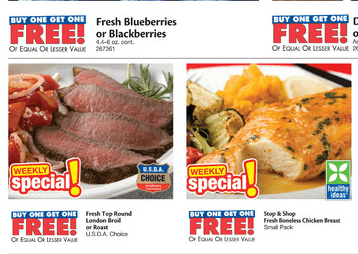 King Kullen also always offers a special coupon like “$5 off an order of $50”. I know you think $5 isn’t a big deal – but it all adds up. $1 here. $.75 there — it can really clear up your total. Facebook is like… magic. The brands have really caught on and a MAJORITY of them offer free coupons on their fan pages. “Like” the brands on Facebook that you frequently use and keep an eye on your feed. Don’t know where to being? Don’t worry! Once a day, I post a round up of all the best coupons on the net. I will supply you with the links to hit in order to get the coupons. This is a little time consuming, and if I’m being honest with you, I don’t really do much of this. HOWEVER, I’m going to start TODAY. How do you know if you are getting a good deal if you don’t remember what you paid last for something? If you get orange juice for $1.99 one week, write that down! That way the next time it’s on sale for $2/5 – you know you can wait and get it at a better price. I have NO MEMORY – so this is an important step for me. I know I am missing out on the absolute low because I don’t record keep. If this is too hard for you to handle, then skip it – I don’t really do it. I just know it’s the RIGHT thing to do because it makes so much sense. Seriously, I’m like a CHILD when this magazine comes in the mail. I practically SKIP to my couch to read it. All You Magazine is filled with coupons – high valued coupons. It’s INSANE! Your subscription will pay for itself and THEN SOME. I also get the weekend paper. If I think the coupons are worth it, I go out and buy 3 more. Why only 3? Because most coupons only let you use 4 per order. And I’m not crazy. I’m not going to split out my order 14 times just to get free dental floss. I do what I can. I’m not saying that you should have your entire town’s policies memorized. I’m just saying get a FEEL of what’s going on around you. Coupon policies are available online. I did a quick search one day and found out that King Kullen doubles coupons up to $1. Most stores only double up to $.99. So I made the switch and now save an extra $10 a week. They only let you double up to 5 coupons per order – so I always bring Bill and we split out what we buy into two orders. If you don’t have someone to go with you, consider making two smaller trips if you have a ton of $1 coupons you want to use. If this sounds like too much work – then don’t do it! The point about couponing is – you do what you can and what feels right. Don’t freak out on me. I’m not saying you should kick out one of your kids and take over their room. I’m saying start to stock up when the sale is good (or free). I mostly coupon for beauty supplies (shampoo, deodorant, toothpaste, makeup etc). I have a shelf in my basement storage room that I use to stock pile. This might be too much for you – but I probably spent $100-$150 on that entire lot. I spend about $2-$4 a week and I’ve been doing it for about 10 months. MIND YOU – we’ve used a ton of stuff throughout the year AND my family / friends always end up picking from my pile. SO, this is what I have left after all of that. Too much? Then don’t do it – but take advantage of deals when they are available. You need a way to manage all these coupons. I have a binder and use envelope folders to split out the TYPE of coupon. On Black Friday, I bought a laser printer and have been in my GLORY as of late. HOW EASY! I’m not wasting money on color ink anymore. I can also put a ton of paper in at once. It’s really a life saver. Everything happens for a reason. Diet products don’t just happen to go on sale in January for the heck of it. They go on sale because so many people commit to a healthy lifestyle during the first month of the year. So, be smart about the timing. Here’s a very high level overview of the coupon cycles. 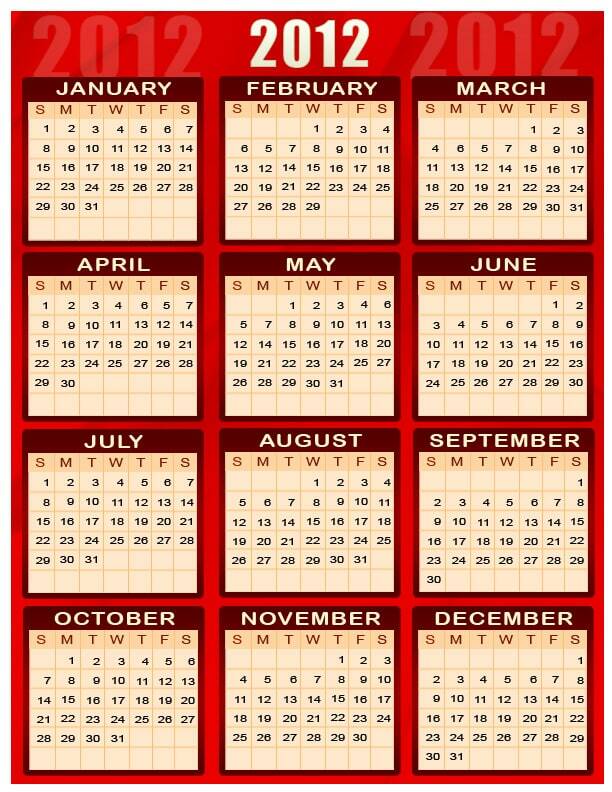 Consider taking advantage of these sales during their months. Seriously, they make it so easy. I make it so easy! Every day I post a round up of all the best coupons / deals available on the web. Take advantage of that. Don’t worry about surfing the net for hours. WHO HAS TIME FOR THAT? Great tips! One of my biggest hurdles is that very few stores around me double coupons (or they only do up to $1 – so they never double a $1 coupon). Great post! 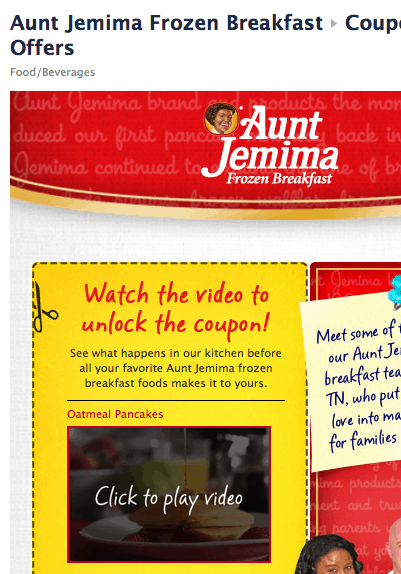 As a marketer that drops coupons often, I still have a lot to learn. Thanks for the info. I’ve got some Kozy Shack coupons with your name on them. Be on the lookout! Great article! I’ve been couponing for years now and I’m always trying to get my friends into it as well. You can experience so much saving and really cut down on your household expenses. 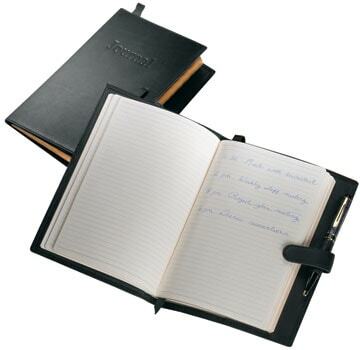 A coupon binder is a must with all of these coupons collected.